Through the most turbulent era in the history of rugby league, Allan Langer has become one of Australian sport's great success stories. His longstanding Brisbane Broncos captaincy and Test career for Australia has made him one of the greats and, as Fatty Vautin says, "the best player in the game for the past six years". At age 20 he dedicated his first State of Origin Man of the Match award to his elder brother as a symbol of heartfelt family support. The gesture was pure Alf. In the decade to come, the sense of flair, foresight and all-important loyalty would go on to characterise his game play and make him a household name throughout Australia. That Man of the Match award introduced him as a player to be watched, highlighting the accelerating talent that first kicked off at age four-and-a-half in an under-sevens match. Langer's story is a football classic, but is was never a seamless fairy-tale ride to the top. He had to overcome the only problem that so much of the professional football industry saw as a disadvantage: his height. But, over the years, Langer's sheer skill, determination and attitude saw him confront and defeat the doubters and go on to a brilliant career. 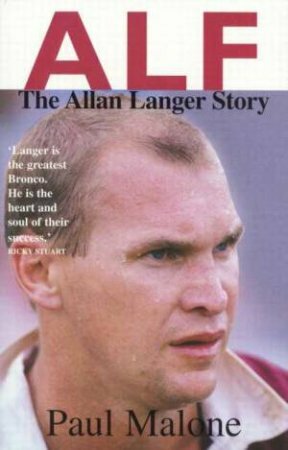 Highlights from this exhaustive biography include his debut State of Origin game; his early years with the Broncos and the struggle to overcome the Lewis legend as their captain; the glory years of the English Tests and Langer's professional rivalry with Ricky Stuart; the Broncos' dual ARL premierships and the controversy of the 1993 win; outrage at the ARL's moves to ban Langer's trademark tackling style; the Super League war as it really happened; who Alf rates as his toughest opponents and favourite team-mates...and of course, the real story behind Alf's gambling.